On April 29th, the Coalition for National Science Funding (CNSF), an alliance of over 140 professional organizations, universities, and businesses, held their 21st Annual Capitol Hill Exhibition. CNSF supports the goal of increasing the federal investment in the National Science Foundation’s research and education programs, and the exhibition itself is a great way to show members of Congress and their staff what research the American people have funded. Greg Hager, of Johns Hopkins University & the Computing Community Consortium, explains aspects of his students’ research to NSF Director France Cordova. 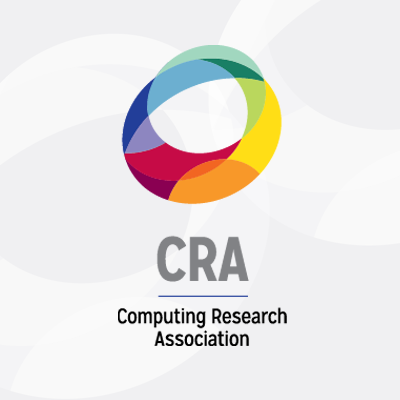 This year the Computing Research Association, a member of CNSF, sponsored three students, two PhD candidates and a defended PhD candidate, from Johns Hopkins University to come to Washington to demonstrate their work. Kelleher Guerin (the defended PhD candidate) and Amanda Edwards demonstrated their collaborative robot for manufacturing, called CoSTAR; while Colin Lea demonstrated a virtual reality interface that can be used to more easily program robots by novice, non-technical users. All three young researchers are advised by Greg Hager, professor and chair of the Department of Computer Science at Johns Hopkins University and Chair of the Computing Community Consortium; Dr. Hager was also in attendance at the event and fielded questions. Amanda Edwards demonstrates the CoSTAR system to Deborah Lockhart of NSF. CoSTAR, a system for human instruction and collaboration with robotic systems, has been developed to enable experts skilled at a task, but not skilled with programming, to instruct the robot as an apprentice. In apprenticeship, a teacher understands the capabilities of the apprentice, and builds on those capabilities until the apprentice can perform the desired tasks. Their system allows for a similar instruction of robots by representing the capabilities of a robot as a set of easy to understand building blocks. A novice end-user can then use these building blocks to create a plan, which the robot follows to accomplish a task. This also allows for the robot to reuse information it is taught across many different tasks. Their system also allows for the robot to collaborate with humans, and respond to dynamic events just as a human would. In addition, they showed how advances in virtual reality could provide an environment for intuitive robot interaction and teaching. Kelleher Guerin explains his work on the CoSTAR system to exhibition attendees. With regard to the virtual reality interface, it was noted that most robots used in factories are old and not intended to be used directly with humans. Users must stand behind shielding where they spend a substantial amount of time programming the robot. The researchers’ work showed how advances in virtual reality could provide an environment for intuitive robot interaction and teaching. Using a virtual reality headset, and a pair of 3D joysticks, a user can virtually move the robot around as if they were performing the task themselves. Colin Lea explains the virtual reality interface to Anita Benjamin of the American Mathematical Society. All of this work is supported from the CISE directorate at NSF. Both projects were well received by the attendees of the exhibition; in fact, the students fielded questions from members of Congress, Congressional staffers, NSF Program Officers, and even the NSF Director, France Córdova. A number of other organizations had displays and were demonstrating NSF funded research at the event. From the University of Illinois’ National Center for Supercomputing Applications “NSF Blue Water” supercomputer, to the American Political Science Association’s “American National Election Studies: Understanding the Changing American Electorate,” to the American Astronomical Society’s “Disruptive Technology & Cosmology at 17,000 Feet,” the exhibition was a great display of the different types of research being supported by NSF. Look here to see a list of some of the participating organizations and what a few of the exhibitors were presenting.